Hey, hey guys! How is everyone doing? I hope your month of May ended in high spirits and the start of June has been fantastic. I also hope you and your heart are well. Before I go into today’s outfit details, near or far, I wanted to say thank you for all the birthday wishes two weeks ago. I am very humbled to be alive and to know such wonderful individuals, who are my mentors and support system, continue to lift me up when I am down, challenge me to get out of my comfort zone, keep me creative, and most importantly, shower me with more love than I deserve. From the bottom of my heart, thank you. Now that we’re now itching to warmer days, I wanted to share and start June with a summer dress that I thrifted from a consignment shop on The Crystal Avenue. When I first wore the floral print dress, I felt the dress needed additional accessories to heighten the look. 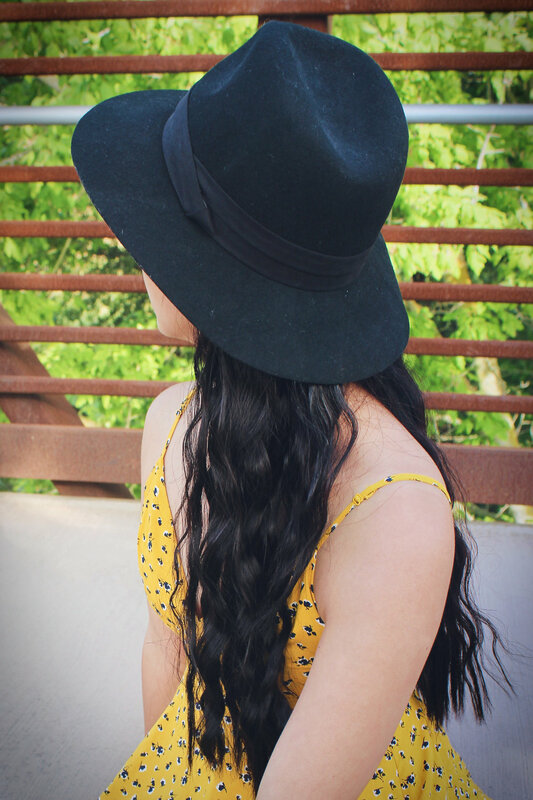 To style today’s look “Honey Dip,” I went back to my trusty hat from Project 6 Nurit Fedora in black, to add a boho vibe. Plus, the hat gives me some coverage from the harsh UV rays. For the remainder of my accessories, I went with my trusty booties, earrings from DailyLook, and my Daniel wellington watch. Catch you guys again with another look soon on The Crystal Avenue.